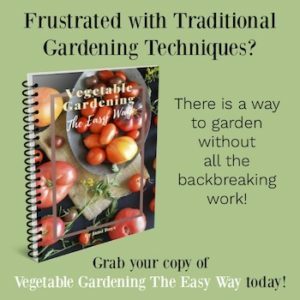 After years of growing vegetables, many when I didn’t know what I was doing, I’ve learned through trial and error what are actually easy grow vegetables – and the vegetables that aren’t so easy. See if you agree! 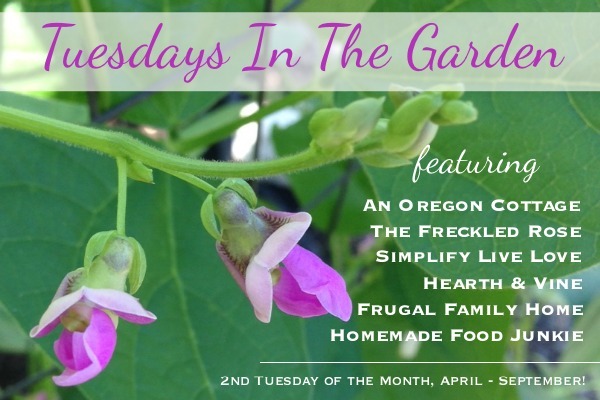 Welcome to Tuesdays In The Garden for 2018! This year you’ll find our group of gardeners bringing you tips, ideas, garden-to-table recipes and more every month through September. 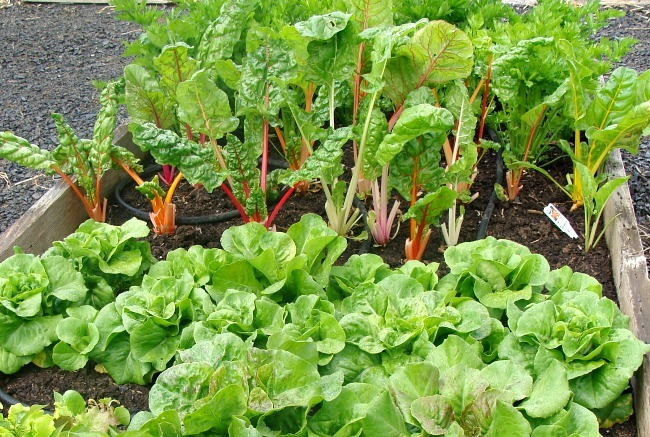 This month we’re sharing ideas to help you get started on your spring garden. Mine includes the vegetables I’ve found that are really easy to grow – find the other great ideas at the end to help your gardens spring into action (like how I worked that in?). 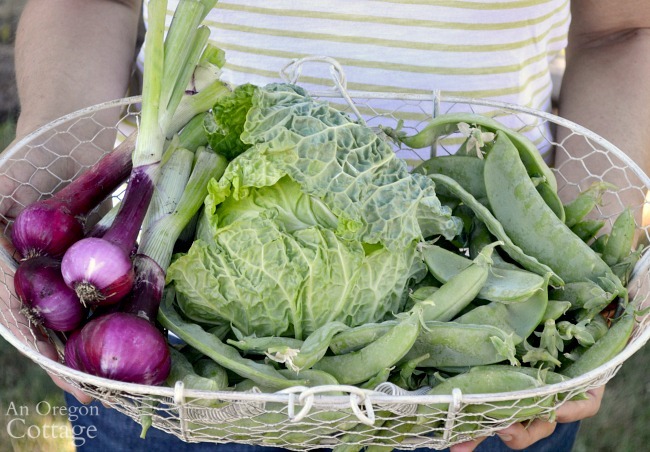 Are there truly vegetables that are easy to grow? 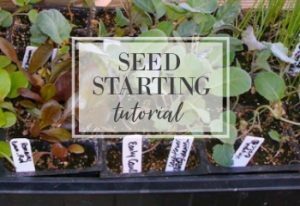 Where you can basically plant them (either seed or transplant) in good soil, give them water, do basic care like staking and trellising, and they will produce food? I think no matter what stage of gardener you are, beginner to advanced, knowing which vegetables will give you a nice harvest with the least amount of work is a good thing. 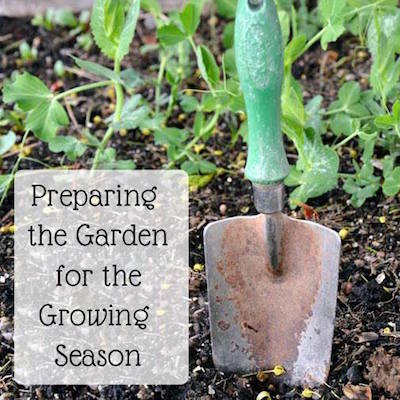 We all need the reward from the work of prepping, planting, and maintaining a garden, right? Yes, you can plant an easy care vegetable garden with raised beds and soaker hoses to lessen weeding and hand-watering. 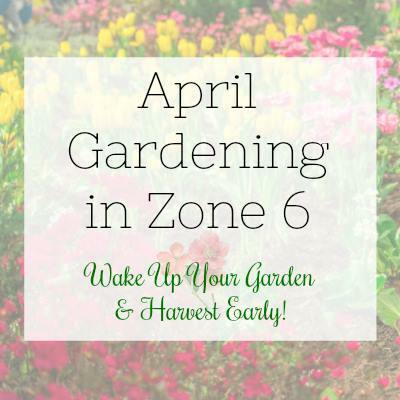 You can start your own seeds and add compost and organic fertilizer to your beds. But in the end if the plants die it doesn’t matter. You need a list of hardy plants to grow. These easy grow vegetables are the plants to grow year after year, forming the backbone of the vegetable garden. 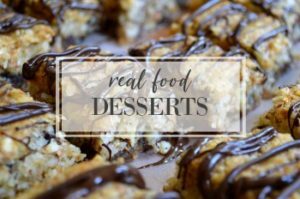 I wouldn’t be without these, and if I want to try a tougher vegetable (cauliflower, I’m talking about you), I fit them in around these tried-and-true favorites. I’m starting with the vegetables that I’ve found to truly be easy to grow. Then I’m going to list four that have not been easy to grow in my gardens, but are often found on lists of easy grow vegetables. I don’t know why – maybe they are easy in some gardens or maybe everyone is just copying from the same list, but I don’t agree and I think my reasons are solid. I’d love to what you think, of course! Rarely bothered by pests with varieties that can take cold and some heat, lettuce is one of the vegetables that can be grown year around almost anywhere. As long as it gets the moisture it likes and is shaded from the heat of the day in midsummer, it will reliably produce for you. Bonus: it’s one of the few vegetables that does well in gardens with less sun. Read more on growing, harvesting, preserving, and using lettuce in The Ultimate Lettuce Guide, including the varieties I like to grow. Potatoes are almost a plant-it-and-forget-it crop. Almost. You do have to keep the tubers covered and keep the varmints away (darn you, voles), but other than that they hardly need anything from you – even watering is minimal. 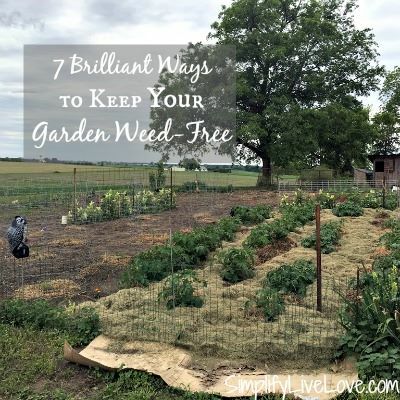 You can plant them in the ground and hill up soil, plant then on top of soil and hill up with straw (seen above in my garden), plant in special potato-growing bags, containers, or even in garbage cans. I used to think you needed a lot of room, but you can fit a bag or can just about anywhere, can’t you? 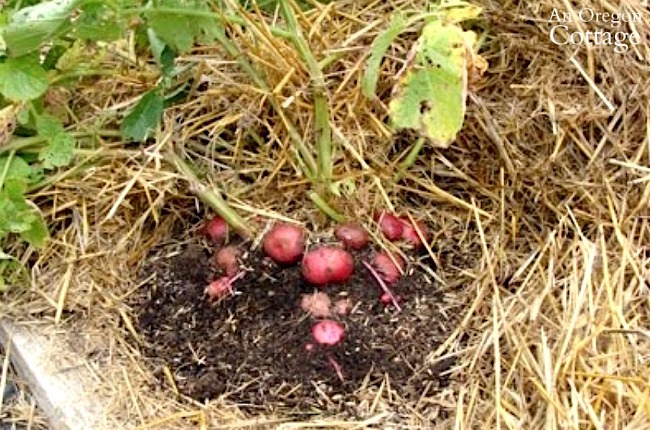 And when you pull back the soil or straw and find the waiting fresh tubers? It’s like finding buried treasure – so fun! 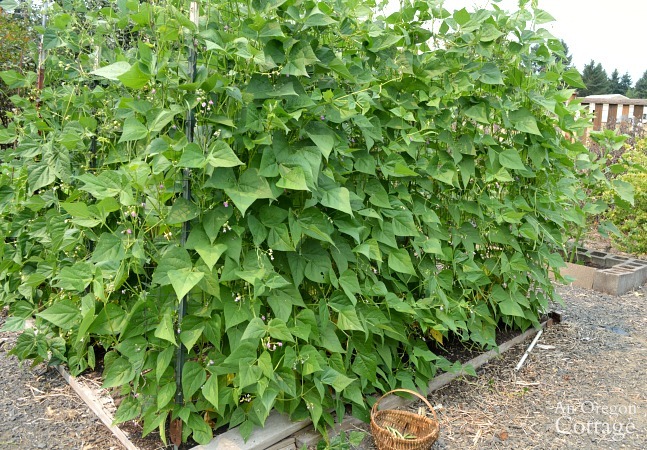 Ah, beans – every garden that has a couple rows will have a dependable food crop. It’s simple to start beans from seeds and easy to get the kids to help, too. They grow reliably with just water. I prefer pole beans since they’re easier to pick and produce a longer harvest, but bush beans are good, too. Just plant some! Read more on growing, harvesting, preserving, and cooking beans in The Ultimate Green Bean Guide, including the two main varieties I grow. Uh, with no photo you can probably guess we don’t really like radishes, so I don’t grow them. But I did grow them the first few years I had a garden because they are so easy to grow – so there’s that. They also provide you with the first food of the spring garden quick, which is nice. None of which matters if your family won’t eat them, which is why I always suggest only growing what your family likes – learn from my experience! 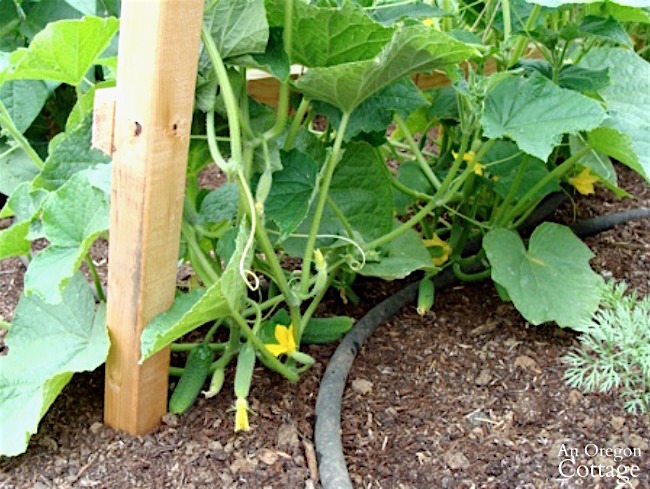 Cucumbers will grow for you as long as you provide them with the water they love. They are vines and will just grow and grow. If you want to make them even easier, train the vines up a trellis like I do. Not only will they be easier to find and pick among all the vines, they are straighter with more even color. Almost every person who wants to grow vegetables plans for at least a couple tomato plants. While they need staking, other than water and sun, that’s about all they need. And wow, the harvest you can get from one plant, especially if you plant a cherry or grape variety. Even if your plant only produces one basket of tomatoes it will be worth it when you take that first sun-ripened bite. Read more on growing, harvesting, preserving, and cooking with tomatoes in The Ultimate Tomato Guide, including the varieties I like to grow. I’m including hot peppers (jalapeño, anaheim, ancho, etc.) 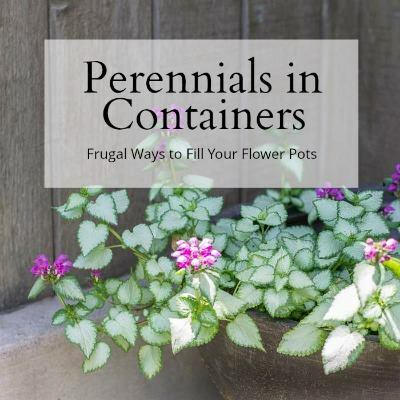 on this list because once you plant them, they will produce a good amount with very little maintenance on your part. And because we eat them in the green stage, so even areas with shorter summers and grow them. When they’re happy, they will produce a LOT. Enough for a batch of canned salsa or pickled jalapenos. 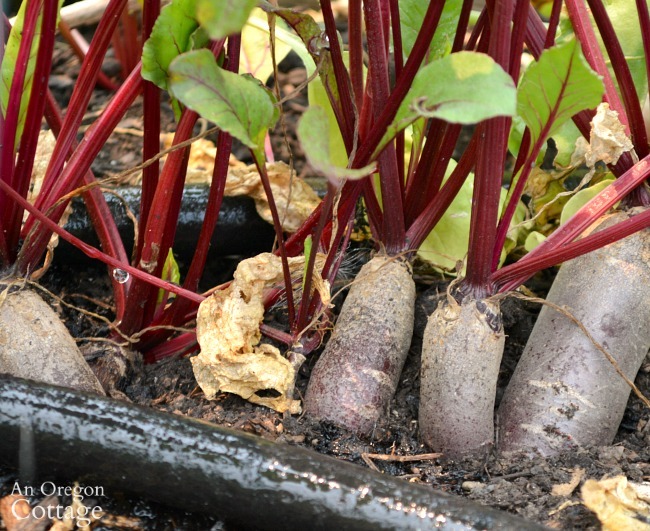 This is the better root vegetable to grow, unlike carrots (more on that below). Yes, they will need some thinning, but since the seeds are bigger than carrots, they’re easier to plant further apart. And you can use the thinned plants for the greens in a salad. Oh, and if you think you don’t like beets, you may want to try this salad. Of course. It may go without saying that this is an easy grow vegetable, though you do need to plant early to get your crop in before the inevitable mildew happens in the fall. Other than that, you just want to make sure to only plant 1-2 plants no matter how big your family is, because the reputation is true – they produce! But that’s not a big deal, because some of our favorite recipes use zucchini. I find onions grown from sets or simple green onions to be the easiest – bulb onions planted as starts sometimes don’t bulb up before going to seed. I especially like the fact that onions can be planted in lots of spots in the garden – along the edges of raised beds are one of my favorite spots. 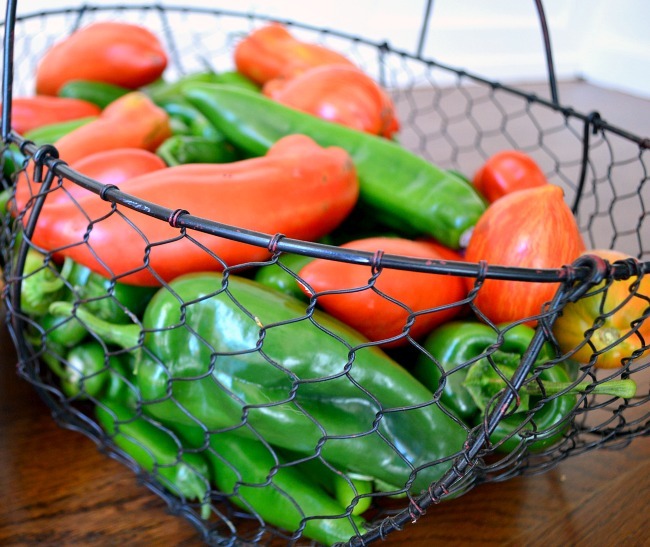 It’s a way to squeeze more vegetables into your gardening space. Read more on growing, harvesting, preserving, and cooking with onions in The Ultimate Onion Guide, including the varieties I like to grow. I love spring-grown peas, they are so tender and sweet! Lucky for me, they are truly easy to grow with a bit of trellising to make harvest easier. Planted in early spring, they produce a LOT. Unfortunately, they don’t like hot weather, so they’re usually done by early July in my PNW zone 8 garden. That’s okay though – it’s super easy to freeze them and then we’re on to the green beans! These two brassicas are not usually considered easy because they are often riddled with bug problems – aphids and cabbage worm. But I’ve found they are actually pretty easy to grow when covered most of the season with floating row covers. This is what made the difference for me, and I know it will for you, too, if you’ve thought these crops were hard. And both of these are not just one-hit-wonders – broccoli will produce side shoots throughout the whole season for me (love!) and cabbage grows sweet little baby cabbages if left after the main harvest. Read more on growing, harvesting, preserving, and cooking with broccoli in The Ultimate Broccoli Guide and cabbage in The Ultimate Cabbage Guide, with some of the varieties I’ve grown. Okay, now here are the vegetables you’ll read all over the internet and in magazines that are usually listed as “easy grow” vegetables, but that I have found are actually not that easy, needing special growing conditions and with consistently spotty results. These are always listed – especially for kids gardens. And while they are super fun to harvest (if they’ve grown well), they are not easy to germinate and get to grow at all. And let’s not forget about the thinning. SO tedious, but if you don’t do it, you will have tiny stunted carrots. What kid wants to do that? This is only easy IF you have enough space. If not, you will have a few rows of decorative stalks that produce small, mostly unfilled out cobs if any at all. They need good pollination which only happens if planted in large groups. Usually listed in with salad greens, spinach is fussy – too fussy to be listed in an easy grow vegetables list. In my experience it doesn’t have the best germination rate and those that do grow barely get big enough to harvest before the weather warms up and they bolt. Spinach doesn’t like much warmth at all. I often do grow these four vegetables, but only after I’ve planted the easier crops above and if I’m prepared to give them more time. And I usually don’t worry too much if they don’t produce that well because I’ve got the rest of the garden planted with almost sure things (is anything ever really a sure thing in the gardening world?). So tell me – do you agree? 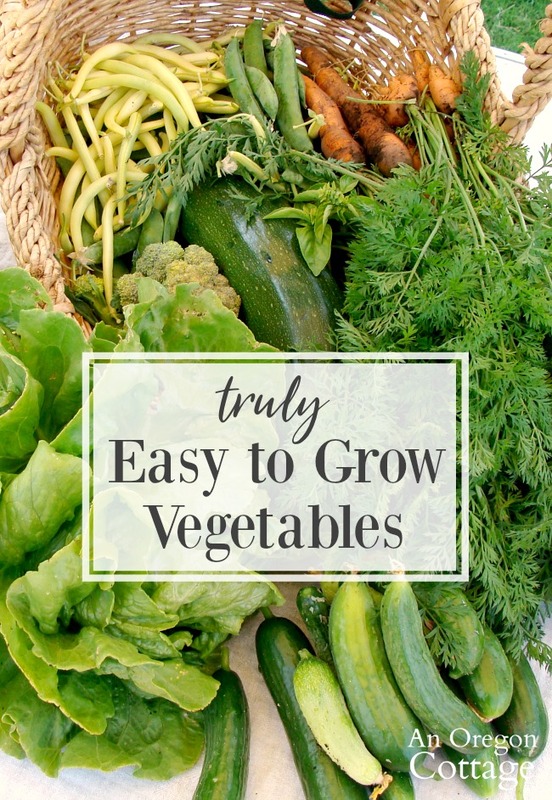 What are your go-to easy grow vegetables? Get more spring gardening tips and inspiration from my gardening friends below – SO much garden wisdom here! Nothing can take the place of snow capped mountains. Texas is the 5th state we have lived in. Here I grow watermelons, Wisconsin rhubarb, Northern California beefsteak tomatoes and artichokes, Indiana cherry tomatoes in February. (Inside and out for this one), Oregon wild berries jam, crabapple preserves and pies. ❤️ Gardening in so many areas. Thank You for your beautiful posts. I agree about the carrots. In my zone 7 garden, I couldn’t ever seem to get them to germinate. But I respectfully disagree about the sweet peppers. I never have any problems here in the southeast getting beautiful red and yellow ones. I can’t remember what zone you are in, but I bet that has a lot to do with it! So I guess I’m not really disagreeing with you. It just a matter of location! So true, Julia! I think I did say for growers in the North (I’m in Oregon) and since they don’t grow well for half the country, I thought they should make the list. 🙂 That doesn’t mean I don’t grow them – I find a lot of satisfaction out of figuring out how to get the most ripe peppers in our cooler climate! I’m glad you found me, too! 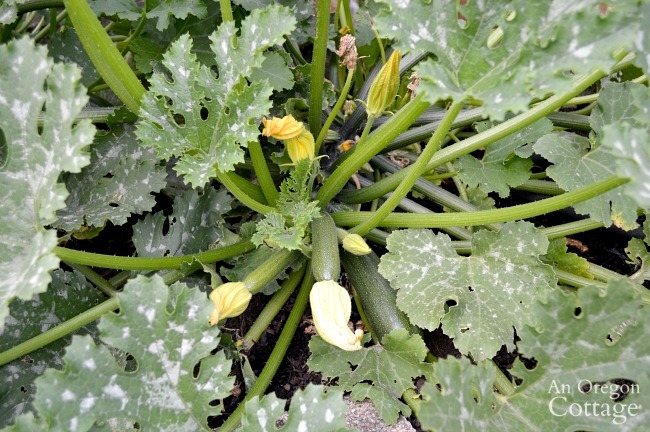 I debated about vining squash and pumpkins – while they are easy, they need a LOT of room and don’t really produce a lot for the room they take compared to the others on this list. I agree with you on most items. I struggle with broccoli. I’m lucky to get one small head off of 10-12 plants. I don’t know what it is but I struggle to grow them. I agree with peas and lettuce, easy to grow here. I think carrots are easy to grow too. I’ve never had a problem getting them to germinate and grow well. I also harvest my own seeds so maybe that is the difference in germination rates. 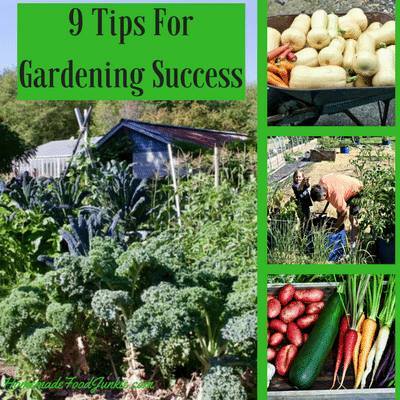 As always great gardening tips, Jami! Bummer about the broccoli – do you think it’s not enough sun? You grow under a row cover, right? Hi Jami, I mostly agree with your lists of veggies, but…I cannot grow zucchini to save my life. We’re trying again this summer, in Earthboxes, with a trellis, and we’ll see. Usually, I get 8-10 little zucchinis, then…the die off. Haven’t been able to figure out which critter is getting to them, but like I said, we’ll try again. I also don’t have a lot of luck with beets, lots of greens, but no actual beets, carrots are too much work and forget the spinach. I do, however, grow potatoes in wood chips and have a pretty good harvest and my green peppers are usually stupendous (even if we’re in Chicago). I am so looking forward to Spring this year! Here’s to a zucchini summer for you! I’m looking forward to loads of zucchini this year! Yep. I would agree with you. Carrots need deep raised beds with a good dirt to grow correctly. We gave up planting them in the ground. They were contorted and half eaten by slugs and worms a lot of times. Dave usually find corn easy to grow (but not always. He has had years where corn failed and he never knew why). And he babies his peppers up from seed every year and fusses over them all summer. Hot and sweet. He just loves em and they need extra care for sure up here in the north. Thanks for the great post Jami! Where are you growing this year? I’m excited to be starting a garden from scratch this year, Diane! We have a level, graveled spot at our new place where an old manufactured home had been that is in the best spot for a garden (though it will have the least amount of sun that I’ve ever dealt with). It’s going to be smaller and I’m having fun designing and thinking about what we want. I actually thought of you and your battles with cucumber beetles when I wrote this! I areas where they’re bad, it’s hard. I know squash bugs can kill a plant in a couple days, too. Do you think growing under cover would help some? Have I ever told you that the cucumber beetles in my garden eat everything BUT cucumbers? They try to decimate my beans and love the peppers, lettuce, even the tomatoes. Sheesh. I want to grow more vegetables in with my flowers this year. This article is super handy for that purpose. I’ve grown tomatoes and lettuce before but may try hot peppers or even beans. Zucchini I know from others experience is super easy and gives you more than you could ever need. Might even try potatoes in a container. We finally are getting some sun today and the weather man predicts warmer temps to come. It’s about time!